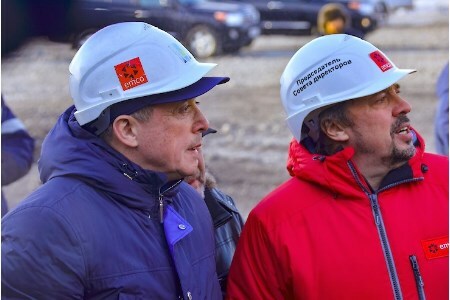 The head of the Sakhalin Region visited the facilities of the Eastern Mining Company; the Solntsevsky coal mine and the coal seaport of Shakhtersk. Chairman of the Board of Directors of the company, Oleg Misevre, told Valery Limarenko about the achieved results of the development of production in the territory of the Uglegorsk district, as well as about its prospects. On 23 January, VGK is a leading producer of energy grades of coal in the Far East and one of the leaders in the coal industry in Russia. The company accounts for about 80% of the total brown coal production in the Sakhalin Region. At the end of 2018, coal mining and shipment by the enterprises of the Russian Railways amounted to 7.5 million t. In 2019, it is planned to increase this figure to 10 million t and more. The main volume of coal mined is supplied to the APR countries. On the Solntsevsky coal mine, the head of the region demonstrated the work of the most advanced and productive quarry equipment on Sakhalin – BelAZ dump trucks with a carrying capacity of 220 t. In total, the enterprise has more than 150 units of modern and powerful mining and transport equipment. This year, the fleet of vehicles is planned to increase to 207 units. The delivery of a career excavator EKG-20 with unique characteristics is expected. It is manufactured by Uralmashzavod specifically for the All-Russian Shipping Company. The capacity of its bucket is increased from standard 20 m3 to 22 m3. Valery Limarenko also visited the control centre of the mine, where he became acquainted with the peculiarities of the use of digital technologies in coal mining. The company has automated the management of mountain transport technology – monitoring, analysis and co-ordination of the work of transport here can provide a special programme. The transition to digital control has greatly optimised production cycles. VGK plans to develop this area. In the port, the participants of the visit visited the cargo checkpoint of ships preparing for opening. His work will reduce the time for customs inspection of vessels that cross the state border and follow to the port of Shakhtersk from day three to day one. In the meantime, both before arrival in Shakhtersk and after it, the vessels are forced to undergo control operations at the seaport of the city of Kholmsk. The checkpoint was built with the help of the All-Russian State Customs Committee, but other coal companies in the Uglegorsk district can use its services. Oleg Misevre spoke in detail about the development of port facilities. Thus, commissioning in 2018 of the 2500 tph Emco-1 loading vessel expanded the company's export capacity, and for the first time cargo ships of the panamax type with a capacity of 70 000 t approached the shores of Sakhalin. The plans are to increase the capacity of our own raid fleet in order to be able to load vessels with a capacity of 150 000 t.
The company pays special attention in its activities to environmental protection measures. To this end, the first stage of water treatment facilities was launched at the section; their capacity by 2021 is planned to be increased to 500 m3. at one o'clock. Measures were taken to reduce the dust impact of the port on the adjacent territory; a mobile dust suppression unit was put into operation. This year, the port area is planned to be equipped with storm water treatment system. Both the section and the port have debugged an environmental monitoring system. The most important direction in the activities of the All-Russian State Company is the implementation of an investment project to create a leading exporter of thermal coal to the APR countries. It provides for the construction of a 28 km main coal conveyor and a deepwater coal port in the Uglegorsk district to increase coal production and shipment. The project will be implemented using the advantages of the Free Port of Vladivostok. For this purpose, a subsidiary company of VGK was created – VGK Transport Systems, which received resident status.